First, again let me say thank you to everyone who read my blog and sent it to others, I am so touched and inspired by all of your comments and support and am hopeful that some of the words and thoughts may help others going through something that they may want some help in “refocusing” their lens. I also want to thank those of you that reached out to me personally and shared your experiences and thoughts, this experience, in and of itself has been such a special 2 days for me and to hear about what has touched your hearts in pain and joy is really inspiring and if you are so inclined at some point please feel free to share here as a guest blogger, it seems to me blogging is good for the soul! Ok, so now back to wine and shoes. Not really, although these two things do make me especially happy, but as you may have guessed they are a metaphor for all the things we don’t do today because we are waiting for a special occasion. How many times have we all bought or received a nice bottle of wine to put it away and say, “we will open in it on a special occasion” and it has literally sat there for years. Why is that? Is no occasion special enough? What qualifies an occasion as special enough? An anniversary, a new house, a baby, a birthday? And at one of those times, how often do you again go to that cabinet or wine fridge or whatever you use to store your vino and say, “no, maybe we will wait” and you open something a little cheaper that you bought at Ralph’s the week before because you STILL are saving that wine for a special occasion. Now, on to the shoes. 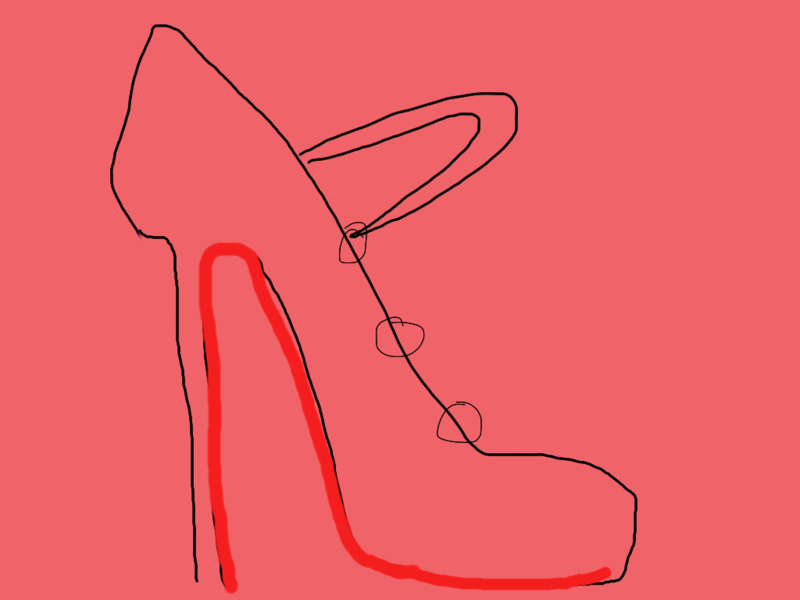 I use Louboutins because I love them like works of art. The shiny red sole, the height of the heel (although anything above 4 inches is likely to cause me to break my ankle – but I still think it might be worth it), and the craftmanship of the leather. I have 2 pairs that I love and when I slip them on I feel like a princess. It’s like being a little girl and you get your special occasion dress (mine were Christmas and Easter) and aside from being lovely and frilly, it would twirl. My sister and I would put them on and twirl all around the living room until we were so dizzy we would fall to the ground laughing hysterically. Putting those shoes on makes me feel like that little girl. We would really only wear these dresses once a year on the holiday they were meant for and after that they would hang in the closet, waiting for the next “special occasion”. When KSP first surprised me with my first pair of Louboutins, I deliberated long and hard each time I thought about putting them on my feet. My thought bubbles looked something like: “What’s the weather going to be like?” “What type of pavement will I be walking on?” “How much walking will I be doing?” “Will they be appropriate for what I am doing” “Will people think I am trying to hard or trying to prove something?” “I don’t want to ruin them”and so on. For me they were like my Christmas dress or a nice bottle of wine, there never seemed to be an occasion special enough, until one day I finally looked at them hanging in their bright red bag and said, today I will wear them just because. Granted it was a work day and I had meetings, but having those shoes on my feet gave me superpowers (ok, not really, but my confidence increased and I think I did actually make some solid decisions that day, or at least I will remember it that way for purposes of my point:)). It is likely that we have all had these moments, but this metaphor actually goes much deeper than wine and shoes. I chose this topic today for a few reasons. Recently some very sad events have happened to friends of mine such as the death of a grandparent, the hospitalization of a parent, medical conditions preventing pregnancy for the short term, and a divorce complicated by other external factors. These sad events always make you reflect on your own relationships and check our perspective on doing things in the moment. But I also had a lovely experience yesterday when I received an unexpected card from my mom. It was a “just because” card basically saying she loved me and that although she doesn’t always know how to help us, she thinks of us, prays for us, and loves us. Thus, a decision based on the fear of loss isn’t my goal here, it’s to show that moments good and bad can remind us to live in the moment. You just have to decide it and do it. The event that will happen for our family tomorrow is not a major event by most standards but for our family it is big decision yet a milestone that was achievable all along but I was waiting for a very special occasion: Emma to get off oxygen. Tomorrow, all 4 of us and maybe even Max our toddler cat, will dress in complementary outfits (here’s is what I can promise you, we will not all be wearing matching sweaters partly because it’s 80 degrees and also because it’s not an option – although we may all wear a nasal canula in support of baby E, which will be very attractive :)) and take our first formal family pictures. Tomorrow will be our special occasion because we deem it to be so. You see, as I said, I kept waiting to take these pictures. Like every other family we talked about holiday cards last year. The first year was obviously not an option as only Q was out of the hospital, but this last December we made a choice or rather made a decision under the cover of making excuses to ourselves of being too busy, not having the time, etc. But the reality is, we were hoping E would be off oxygen and then we would send out holiday cards. But November’s pulmonary appointment brought no good news and we were told to come back in February. In February, we geared up hope again, and we were told to come back in April for a sleep study where we would then assess her progress and prognosis. So now you must be confused, because, April is now and our appointment is Tuesday. E will be sedated and be evaluated for her ability to maintain her oxygen saturation levels and hopefully we will be greeted with news that we can start to wean her in the coming weeks, but in the spirit of mynewfavoriteday, Tuesday may bring more of the same and so why wait? Don’t get me wrong, that news would be sad for us and like everytime before, we will get in the car and cry for the ever-moving light at the end of the tunnel but if we don’t hear the news we want we will now be able take solace and joy in our new family photos and the fact that we didn’t wait. We captured their sweet smiles and loving souls on the perfect day, tomorrow. Our precious babies are getting older and let’s not even talk about my alarmingly progressive and aggressive gray hair and wrinkles that seem to be attacking me daily…thank god my life is not in HD and I can keep the lighting dim in the house- so the time is now, tomorrow. So life is about celebrating about the big occasions and small and what that means to you. Be grateful for both but remember each day is special because you have it. Last night KSP and I cracked a bottle of wine. Just the two of us. It’s been a while since we have done that together and it was a special occasion, we closed on a new house yesterday. And this time, instead of going to the bar and selecting the $9.00 Gnarly Head Zin, we selected the Pinotage we bought in South Africa on a Habitat for Humanity build in 2007, and although the cork crumbled into the wine, we still drank it and celebrated our very special occasion with our special occasion wine. Friggin yes! Live it. Enjoy every proverbial drop of pinotage. Life is now, drink up :). Some will read this post and may think that it’s a bit sad that nothing is “special” anymore, but those of us who’ve walked through a dark place in our lives know better. We’ve learned that everything is special. Every day that we get to wake up and experience a new day is special. Every smile is special. Every laugh is special. Every moment is special. It’s all special because we’ve learned how lucky we are to see and experience all of these wondrous moments. Moments we should never wait on because we’ve been given the gift of them now. Never wait. Lesley, this is so beautiful, thank you for sharing. It sounds like you have known your share of hard times but have made a choice to cherish the moments. They come and go, but how special that you can treasure them when they happen. Thank you for reading and posting, it is so lovely to have your powerful words written here, I hope you will keep posting when you feel inspired to do so. every day i have to make a choice – to fight the good battle and get out of bed, make my latte and get to work – prepare for the coming home of the family and put on a happy face. i hate the days i can barely get up enough to say goodbye to A as she heads out to school – it’s almost like she’s the one taking care of me on my worst days. kissing the boys good-bye is almost like a dream – barely remembering by lunch if i said ‘i love you.’ i’ve had enough of the battle. i know there’s a dark space in me that i can’t control, that’s a genetic line from my mom to me, and i’m doing what i can to stop that now. today. my new favorite day is today. and it will be again tomorrow, the next day, and the day after. there is no comparison between our worlds and yet i know our hearts are heavy for different reasons. you inspire me, my friend, with your words and your actions, your strength. Lesley, too. it is going to be a great day today. i will celebrate with you, my friends and my family, all the little things – the scratching of C’s back this morning, his little smile and “mommy’s the best” competitive edge i got over daddy today… and braiding A’s hair, being up with her to wish her a great day and hug her and be conscious. be present. so my battle is a little different than yours, but ours are the same in the love and health of our family. and we will win the battle – my favorite day. i love it, S. simply. love. it. Pinks, you are an inspiration! Thank you for sharing this. It’s such a personal struggle and it takes such great courage to share it. You hide it so very well. I am glad to you are making the choice, it’s challenging but you are so so so so very worth it. You are a remarkable person and you will be able to tell by the teary message I left you, how moving this is. There are so many people that carry this same dark place and feel helpless. Your heart is broken and how to fix it is a mystery. This will help so many people in knowing that it’s ok to be depressed and they are not alone. They can be inspired by you to help themselves make that choice to accept the things they cannot change and make the choice to be present to change the things they can. I love you and I know this for sure, I am not alone. This is wonderful and exactly what I had hoped for. Please please please share your thoughts, experiences and any links. And I will do you one better and put this link into my blogroll so that anyone else who may be battling these same emotions might benefit as well. Thank you for sharing, I know it’s hard sometimes, but you have a beautiful soul my friend with many people who love you, please remember that on those most challenging days. love the Laboutins. and this message. Drink the good wine, wear the good shoes. Every day is worth celebrating. Great attitude! Happy SITS day! Thanks so much Kristi. I really appreciate you coming by! Well spoken. If you live each day waiting only for the next one, then you can’t truly enjoy the one you’re in. Happy SITS day!! I can say the same to you, well said. I couldn’t agree more! If we spend our time looking back and forward we can’t truly appreciate all that is around us today. Thanks for coming by and saying hello. Have a great day! Who was it who said… “Eat, drink and be merry, for the end is sure to come”? You are right. LIfe is full of timy celebrations that are important to your existance. So many mini moments to celebrate, we just need to stop long enough to see and experience them! A wonderful post. Celebrate the present! Life is so much easier when you appreciate the little things rather than waiting for bigger things to happen. Ha, I never save bottles of wine, probably because I’m 25 and single, and don’t appreciate the taste difference of expensive wine. Clearly, I can’t afford Louboutins either. That said, the sentiment still very much speaks to me 🙂 visiting from SITS! LOL, yes, well I have a few years on you and had none of these things when I was 25 either, but I am glad the sentiment rang through:) That’s really the most important part because you can take that on at 25 or 35 or 65! Thanks for coming by! Yes, yes!, wear those Louboutins! Wear them, twirl in them too and feel lovely! We have to do that sometimes. That little girl needs to be let out because life is so grown up and difficult for the most part. Fabulous post! Stopping by from SITS. Yes indeed, slip on those Louboutins, and even twirl in them! Little girls need to be let out sometimes, because the world is just too grown up and difficult. Beautiful post! Stopping by from SITS. What a great reminder to live for today. happy SITS day! Thanks Illene! I so appreciate you have come by, thank you! Have a great day! Love the sentiment! I have a habit of never “saving” anything for a more important occasion. Life’s short; there may not be another opportunity. Thanks for the reminder! I so love this philosophy and totally agree. Life is short and things do change in an instant. Thanks for coming by and for saying hello! “Life is about celebrating about the big occasions and small and what that means to you” I so agree!! We need to learn to cherish everything.